The Go Berkey® Kit is the designed for backpacking, hiking, camping, college students, world travel (business or vacation), on your desk at work or hundreds of other activities. 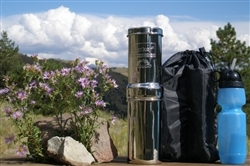 The generic Sport Berkey® portable water filter bottle is perfect for when you are out on the trail and the Go Berkey® system works great for passive purification back at the campsite, lodge, etc. The generic Sport Berkey® portable water filter bottle can also be used to prime the Black Berkey® Purification Element when water pressure isn't available. * Flow rate calculated with upper chamber full to top. Flow rate decreases as water level declines Orders processed on the next business day. In-stock items will ship withing two (2) business days.